High Powered, Tough Cleaner ... Super Gentle! They must be safe to the user. They must be environmentally friendly and safe for our planet. GTech™ can be used to quickly & safely remove soils & stains from most surfaces such as oil, grease, brake dust, carpet stains, algae, paint, grass stains, red mud, lipstick, food stains, bugs & tar, soap scum, RV & trailer black streaking, shoe marks, & so much more. And, you don't have to "break the bank" to get the best! Visit our Home Page to see our slideshow for results. We are one of your best alternatives to cleaning/degreasing products that is safe for you and our planet. Ingredients such as Butyl, Methylene Chloride, Cresylic Acid, Butoxyethanol, Sodium Metasilicate, Sodium Hydroxide, etc. are very harmful to your body and the environment. Simply search these ingredient names and you will find a multitude of warnings and dangers of using such products that contain these ingredients. With that being said, we pride ourselves in the fact that we use safe ingredients in our products and in knowing we are keeping you and our planet safe. Our promise to you is that you are using a product that is as effective or more effective than any other product available that contains hazardous ingredients such as phosphates, NPE, caustics, acids, or petroleum solvents. At GTech™, we feel that as a society, it is our responsibility to use safe products that don't harm people, animals, or our planet! You can rest assured that you can use GTech™ without harmful side effects. In fact, as of February 5, 2018, we have been approved as a Safer Choice Product which is monitored through the EPA. This was an almost year-long process...The approval letter is below. Click Here to see what it means to all of us to use products approved by the EPA's Safer Choice program. EPA/Safer Choice recognition does not constitute endorsement of this product. The Safer Choice label signifies that the product's formula, as Green Technology Cleaning Solutions, LLC has represented it to the EPA, contains ingredients with more positive human health and environmental characteristics than conventional products of the same type. 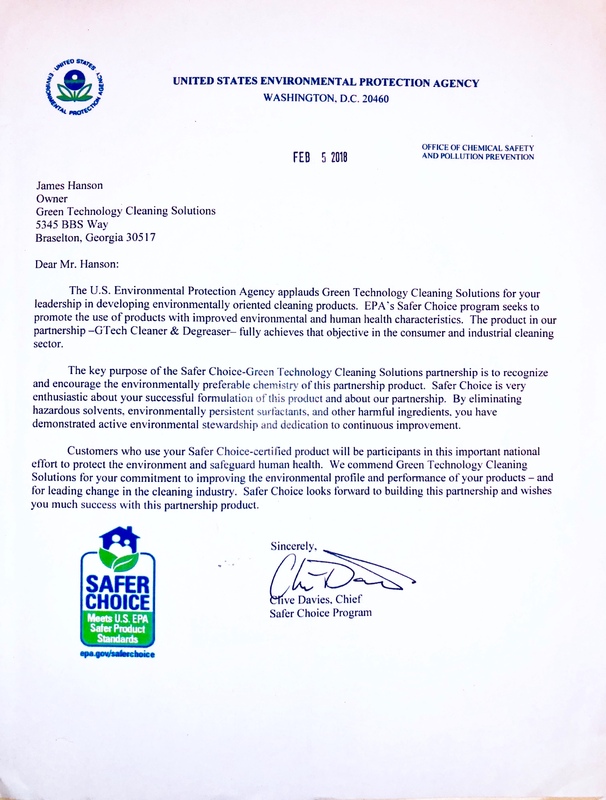 EPA/Safer Choice relies solely on Green Technology Cleaning Solutions, LLC, its integrity and good faith, for information on the product's composition, ingredients and attributes. EPA/Safer Choice has not independently identified, that is, via chemical analysis, the ingredients in the product formula, nor evaluated any of Green Technology Cleaning Solutions, LLC non-ingredient claims. EPA/Safer Choice provides its evaluation only as to the product's human health and environmental characteristics, as specified in the Safer Choice Standard and based on currently available information and scientific understanding. Please feel free to Contact Us if you have any questions. We'd love to hear your testimonials or help solve your safe and responsible cleaning needs! Click Here for product ingredients.